Loved this one. So much presidential history! Some of which I know, a lot of which I did not know. The author's writing style made this an enjoyable read. The author, Gene Boyer, retired from the Army as a Lt. Col. (His service as a White House pilot actually limited his promotion potential.) He led an amazing life -- the people he met, the places he went, the amazing experiences. Just one example, while working in Venezuela he saw Sputnik fall to earth in flames. A number of near misses with death. Many famous people.Still, the book is an easy interesting read rather than a simple catalog of his life. He's a man I would like to know and his integrity, loyalty and devotion to our country and its presidents clearly represent the best of our military.He has little use for LBJ who he portrays as a rule-breaking egotist whose whims actually took lives. On the other hand, despite Nixon's resignation (he actually flew Nixon from the White house on the day Nixon resigned), Boyer had both admiration and sympathy for the man who was unfailingly polite to him.All in all, a retelling of a remarkable life and the book includes many photos. This book is truly a time machine and you really get a sense of what this guy experienced as the president's helicopter pilot. He served under Eisenhower, Lyndon Johnson, Richard Nixon, and finally before retiring Gerald Ford but he did not complete a full presidential term with Gerald Ford he retired before the end of forts term.He starts out with a lot of background about himself and gives you a literal birds eye view of Vietnam and won a graphic and horrendous time this was for our nation. In addition you also get a lot of perspectives in what it takes to maneuver the president in the most efficient way possible. Also you see what dedication the pilot provides to his commander-in-chief. Mr. Boyer was also in charge of transporting many VIP officials and during those missions he demonstrated a great deal of professionalism that would not be easy to do under the circumstances of his job.Anyone who read my reviews knows that I am very keen on pictures and I can say this is the first book I have read in a while that not only adds personal touch and perspective but the pictures also help tell the story. The pictures also add a lot of up close and personal imagery that no other book that I have read can even come close to doing.Finally Mr. Boyer's sense of humor throughout this book really gives this book the character that it deserves. 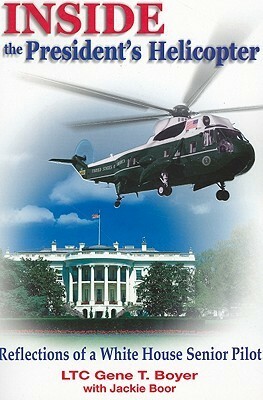 I was glad to hear they had restored Nixon's helicopter and it will go on to tell stories for future generations. Whether you're a military buff, presidential buff, aviation buff, and lastly history buff this book appeals to a wide range of audience that you just cannot wait until the end to see how it turns out. Fascinating history. There are recounts about President Johnson that made me laugh out loud: When the air conditioning on the helicopter wasn't functioning, LBJ looks for an axe to break out a window; LBJ hires seven secretaries...at least 2 of them could type; trips to the LBJ ranch 'under the radar'. Major Boyer details some experiences with the Presidents that he was privileged to transport. Very insightful. But he does jump back and forth alittle and gives too much detail on his family life that doesn't enhance the story. Overall worth reading! Found it to be an interesting book. Insightful sharing of the life of the preident's pilot. Full of opinions formed at duty and well thought out. What I really wanted was his 'slant' on the presidents and it was there as hoped.